THE outlook for Europe’s leading online gaming company just got clearer. tombola’s new high-tech Sunderland headquarters will be using the world’s most advance glass in the commercial building industry. People with views and a connection to the outdoors have a 10-25% better mental function and memory, and in an office environment, those with access to natural daylight are 18% more productive. Paul added: “As the high-spec design evolved it was agreed that the striking trio of roof pitches and feature glazed east elevation should not to be diluted with any internal and external shading systems. “After extensive research, we discovered SageGlass (a product of Saint-Gobain), which met all our ambitions for the building from an aesthetic and biophilic perspective - as well as offering significant performance benefits in terms of energy use and comfort. With virtually all of tombola’s staff working at a monitor or screen, mitigating glare is essential. With SageGlass, personal settings can be programmed centrally by tombola enabling them to control the working environment by letting in as much or as little visible light and heat as desired, while minimising glare. 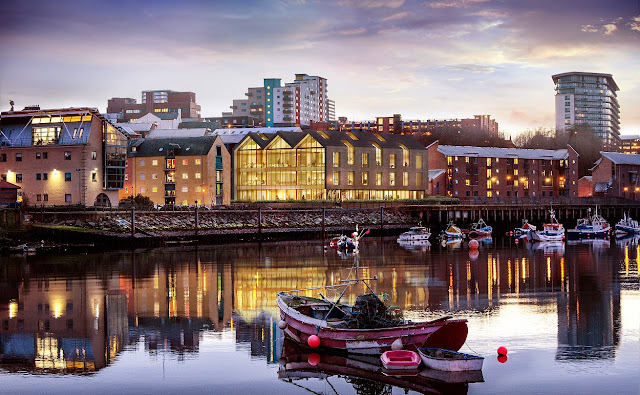 “tombola has a deep connection with the city of Sunderland and allowing team members to remain connected to the lifeblood of the city, even when inside the building, was extremely important to them during the design process,” said Alan McLenaghan, CEO of SageGlass. With over 550 patents and manufactured in the largest and most advanced electrochromic glass plant on the globe in Minnesota, U.S., SageGlass makes the world’s most intelligent electrochromic glass that is as dynamic as the people it benefits. Since the first construction project using SageGlass, the company has installed electrochromic glass in some of the most iconic buildings across 27 countries.